As you may know, there are two major Dynamics 365 for Sales (CRM) releases per year—April and October—offering new capabilities and functionality (for Cloud subscribers). The April 2019 release will be here before you know it. If you haven’t had a chance to read through all 86 pages of the April 2019 release notes to see what changes are ahead, fear not, we’ve summarized 4 of the most exciting changes for you below. Today’s sales process often requires sales reps to collaborate across departments when working on a sales opportunity. 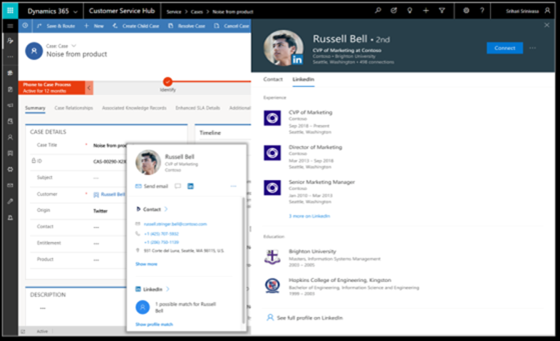 The Dynamics 365 app for Microsoft Teams enables sales reps to collaborate more effectively using Microsoft Teams. Sales professionals can collaborate with anyone through conversation and share files while easily accessing the latest customer information, all without leaving Microsoft Teams. This enables a sales organization to capture knowledge and best practices and convert them to scripted lists of activities (including phone calls, tasks, and appointments). Playbook is manually triggered or preconfigured to run based on entity record events (for example, a new opportunity or lead creation). Forecasting helps users in situations where external checks and adjustments need to be accounted for. It's also a great way for small and midsize organizations to adopt the forecasting process before stepping up to predictive forecasting. These updates will be backward compatible, so your apps and customizations will continue to work post update. And don’t worry—new features with major, disruptive changes to the user experience are “off” by default. This means administrators will be able to first test before enabling these features for your organization. For those Dynamics 365 Cloud subscribers looking to get a head start, you can preview the upcoming updates ahead of time. If you’re an active Dynamics 365 CRM customer, you have the option to enable the preview. This article will show you how. You can review the complete April 2019 Release Notes here. If you are an on-premise Dynamics 365 customer interested in migrating to the Cloud, BroadPoint’s Dynamics 365 CRM experts would be happy to help. Connect with BroadPoint today!